Creamy vanilla ice cream, swirled with funfetti cake batter mix creates this smooth and indulgent Funfetti Cake Batter Milkshake! Last week, the hubster and I ventured out to Dairy Queen. We both had a craving for ice cream…well, more so the hubster, (he practically eats some every night), so we decided it was a DQ kinda night. We both usually get the same thing…a French silk pie blizzard for the hubster, and either the brownie batter blizzard or some other type of cake-filled one for me. But when we walked in the door, I immediately spotted a colorful poster advertising a funfetti cake batter blizzard. Funfetti? In a blizzard? Well, sign me up! As we settled down at a table outside to enjoy our frozen treats, I eagerly took a bite of my blizzard. “Whoa…frosting overload!” was the first thing that came out of my mouth. Vanilla ice cream was blended with sprinkles and frosting, lots of frosting! A little too sweet for me, seeing as I’m not really a frosting kind of gal. I’m the type that usually scrapes the frosting off the tops of cakes and cupcakes because it’s just too much sweetness for me. Don’t judge, guys…I much prefer to eat the actual cake instead! But back to the blizzard…while I was able to eat most of it, I decided that this would not be my new favorite treat from DQ. Sigh…I had such high hopes for this blizzard! A few days later, I was still thinking about that funfetti blizzard and how it just wasn’t what I expected. So the idea popped into my head. I bet I could create my own frozen treat, tone down the sweetness a bit, but still maintain that funfetti cake-batter goodness. Yep, I was on a mission. 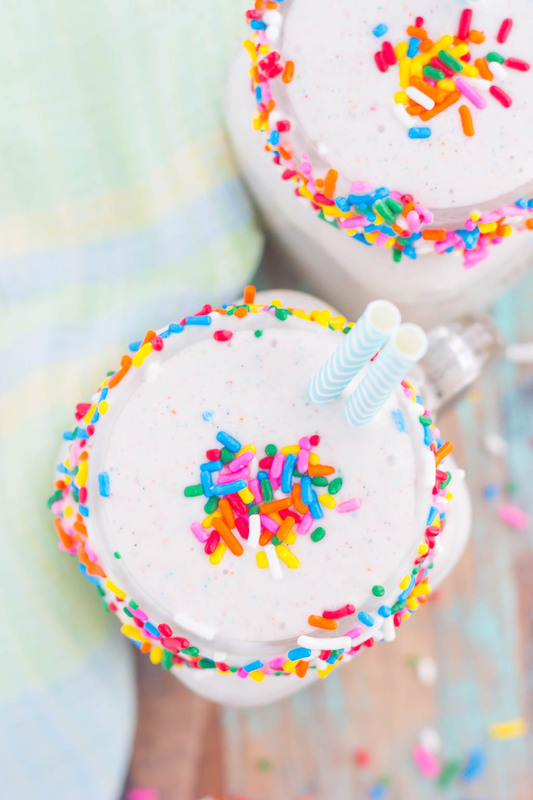 So, let me introduce you to this deliciously, sweet (but not too sweet), Funfetti Cake Batter Milkshake! Unlike my Dairy Queen fiasco, this shake has just the right about of cake batter sweetness to it. I was so impressed with how this turned out, that I quickly whipped up another one for the hubster. After all, he’s the true ice cream expert in our house! Just three simple ingredients is all it takes to create this delicious milkshake. And don’t forget the sprinkles! I added extra sprinkles into the milkshake to give it a pretty pop of color. After all, what would a Funfetti Cake Batter Milkshake be without sprinkles? Looking for more frozen desserts? I’ve got you covered! In the canister of a blender, combine the ice cream, cake mix, milk, and sprinkles. Pour into two glasses and top with sprinkles and whipped cream, if desired. Thanks, Medha! The cake mix makes the shake taste like cake batter and gives it just the right amount of sweetness! Ooo, I bet yours was so much better than DQ. I am the same way with frosting, I only want a little and I will scrape off any extra. I could really eat cake with no frosting actually. So I'm sure I'd enjoy your milkshake. It looks so pretty & fun! Glad you're the same way with frosting, too, Leah! I would definitely eat a cake with no frosting as well! And I think you would love this milkshake! Just the right amount of sweetness, and no frosting! 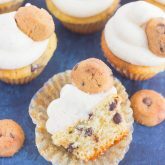 I love that you used actual cake mix in this recipe, this sounds sooooo delicious! I like frosting, but sometimes it's too sweet and overpowers everything. I love that this is just simple and easy to make! Thanks so much, Danielle! The cake mix gives this shake the cake batter taste, without having to use frosting! Thanks, Arpita! This shake is so easy to whip up, and definitely husband-approved! My husband has already requested this shake more than once since I made it. I hope you like it if you try it! I bet this is delicious, very clever to add cake mix, had to look twice at the ingredient list to be sure. Thanks so much, Cheri! 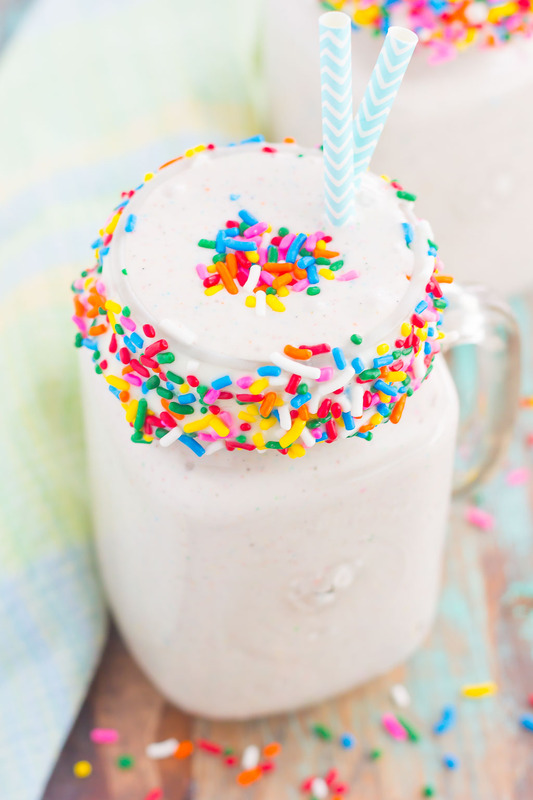 This funfetti milkshake turned out deliciously sweet with true cake batter flavor! If you like cake batter, then this is definitely the shake for you! if i could drink one of these every day for the rest of my life i would be one happy person.. definitely brought back some childhood nostalgia! thanks gayle. Thanks for the shake compliments, Thalia! Cake batter is such a fun flavor! My hubster is the same way, he always needs dessert after dinner! 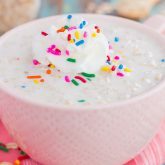 Funfetti is one of my guilty pleasures and I love that you made it into a milkshake because milkshakes are pretty much the best! You can pretend that they are just a drink and not a dessert, which makes it ok to have every night, right!? Gayle, I'm sorry you were disappointed but I'm kind of glad you were so that you could bring us this amazing milkshake! I'm loving the colors and I'm sure it's perfectly sweet but not over the top! Thanks so much, Bri! I guess my Dairy Queen fail turned into a great milkshake recipe! My husband is like yours, eats ice cream constantly, loves it! I guess all men love ice cream though, don't they? Even went to DQ once ourselves but I would much rather make your cake batter milkshakes. I used to work an an ice cream shop and would advice everyone out there to make your own milkshakes, don't go out if you can help it if sanitation is a big thing for you!! I couldn't believe what other workers would do, hello double dipping. Love the funfetti. Could even serve these at a birthday party with a funfetti cake, who wouldn't love that!!! Yes, I definitely think most men love ice cream, Laura! And while I like it too, I just can't bring myself to have it every night. I'm sure you saw a lot of not-so good things when working at the ice cream shop...I can only imagine! And yes, this would be great for a kid's birthday party! So fun and festive! 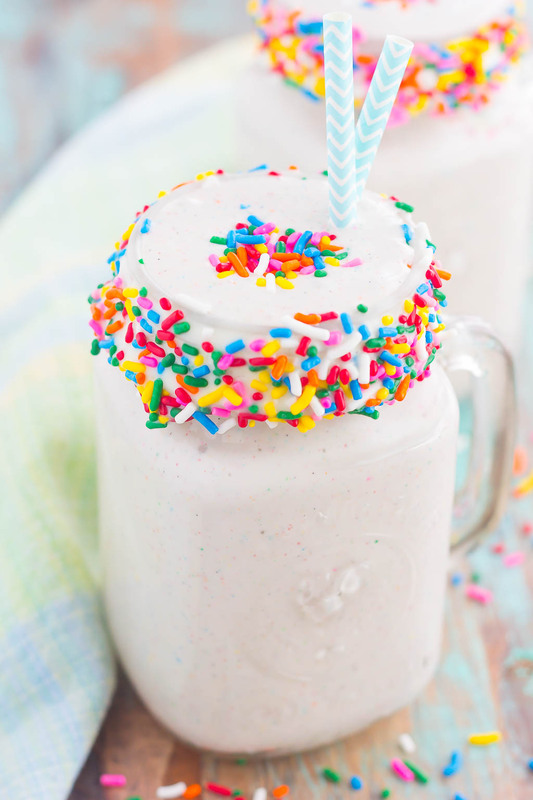 Funfetti Cake Batter Milkshakes are the best! Homemade ones are so much better and way tastier than anything you can buy. Yours looks incredible, Gayle! Thanks so much, Kathi! Homemade ones are definitely better. You can control the ingredients, the taste, and the size. Definitely a plus in my book! How disappointing!! I rarely try something new at DQ for that same reason, and just end up with my old standby, the Banana Cream Pie Blizzard. I am in love with this milkshake, for obvious reasons! We don't have a Dairy Queen nearby, which is both the best thing and the worst thing. Good, because it saves me from myself. Bad, because I getting little blizzards at Dairy Queen! When we're on roadtrips I always have to stop at a Dairy Queen and get a Reese's blizzard. The best! That is SO SMART to use the cake batter mix in the milkshake! I was thinking you'd have to make a whole cake, which I would probably eat before it ever got a chance to make it into the milkshake. This sounds just delicious Gayle! Reese's blizzard are delicious, Natalie! It seems like we have a DQ on every corner around here (along with a variety of other ice cream and frozen yogurt places), but luckily, I can control myself, for the most part! :) This milkshake is definitely super easy with just using the cake mix and not the actual cake. Although that would be even tastier with chunks of cake in here! OH MY ! What an awesome milkshake - I want one of these. Im not a big frosting person either - for the same reasons - too sweet for me! Thanks so much, Archana! I think this milkshake would be perfect for you! Sweet enough, with true cake batter flavor! Thanks for stopping by! Thanks, Kathy! I think you and your daughter would love this shake! I definitely think this is better than DQ's...tastes home-made, and is creamy and delicious! I've been craving DQ since they announced that the s'mores blizzard is back. I need to go ASAP! Well hopefully you will give this Funfetti shake a try, Erin! I think it definitely rivals Dairy Queen. Thanks, Denise! The funfetti blizzard was just ok, but this shake is amazing! It was a first for me, but definitely not the last! Oh wow this looks awesome! And it's just so fun :) haha anything with sprinkles is fun in my book! I seriously haven't had a milkshake in probably years ... I eat ice cream a lot but never milkshakes! Which is crazy since I sure do like them! Thanks, Ashley! Sprinkles definitely make everything better! :) You know, I was never really a milkshake person until the past few years, either. But ever since I received a new blender for my wedding shower last year, I've been whipping them up like crazy! Thanks, Jess! This shake is super easy to make, no baking required! It will definitely cure your sweet tooth, too. 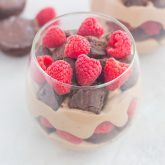 I was just telling my co-worker how it feels like a DQ kind of day... but I wait until I get home and make this instead! YUM! My husband and kids love ice cream. If they could have it every night they would. I wouldn't have thought to use a cake mix in a milkshake? Smart way to get that actual cake flavor :D My daughter was just saying she wants to make milkshakes tonight. I'll have to show her your recipe. Thanks, Cindy! The cake batter gives you the funfetti flavor, without actually putting chunks of cake in here. I think your daughter would love this shake! It would be easy for her to whip up, and I'm sure she (and your husband) would love the flavor. I hope you enjoy if you and your family try this! What an awesome milkshake flavour! I love milkshakes - I will have to try! Thanks, Jessica! It's delicious and so easy to whip up! My favorite kind! I agree, Consuelo...the cake always wins in my book! And this shake is definitely better than a store bought one! 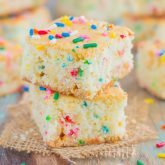 It is so easy to whip up and tastes exactly like cake batter! I hope your siblings love this if they try it, Mary Frances! We would make the perfect cake eating team. I'm a lick-the-frosting-off-the-cake kind of girl. I could skip on the cake part entirely! This milkshake looks like such a great summer treat! What an awesome recipe, my son just saw me checking it out and said "Mommy I want one of those!" ..me too! Sounds like we would be a perfect, cake-eating match! This shake is great for the summer and tastes just like cake batter. I think your son (and you, too) would love this! There are four kids in my family, two of us prefer cake, while the other two prefer the frosting. At every single birthday party or celebration we have ever gone to you could see the four of us huddled together scraping the icing off and trading it for the cake, or vice versa. Ha! Your story totally took me back!! :) I love this shake! It is fun, I bet it tastes fabulous! I need to make it for my frosting loving siblings! Sounds like you and your siblings made a great cake team, Annie! This shake definitely hits the spot. I'm sure your siblings would love it! Gayle! This milkshake looks SO good! Dangerously good even, given that it only calls for four ingredients (sprinkles are a must). I'm with you on the over-sweetness of frosting. I'm all about cake, cupcakes, etc., but too much frosting makes my teeth hurt! This recipe looks perfect! Thanks for the kind words, Alyssa! I definitely agree that too much frosting makes cakes and cupcakes just too sweet. But this shake has just the right balance of it. Sweet, but not too sweet! LOVE cake batter anything, especially when it involves ice cream! This milkshake looks amazing! Pinned! Thanks so much for the kind words and pin, Danae! 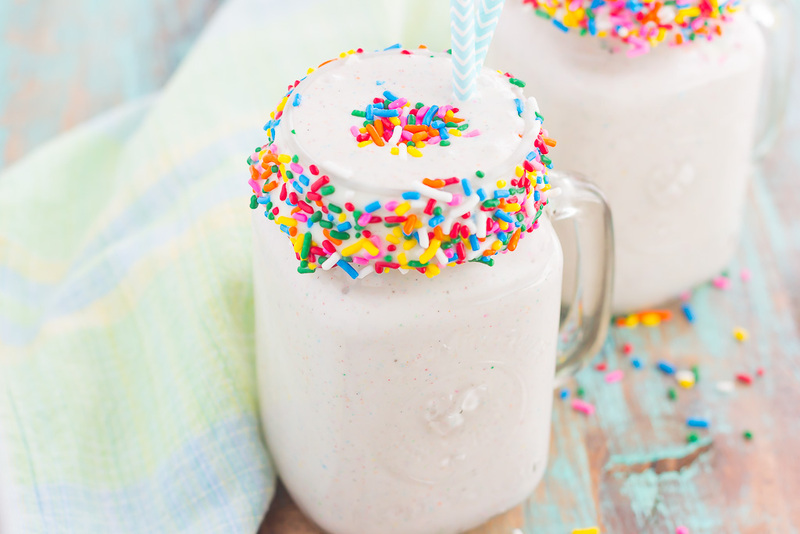 Cake batter milkshakes are now my favorite, especially with the simplicity of making these! That funfetti dip sounds delicious, Cailee! I'm sure this shake would be right up your alley then...the perfect combination of sweetness and cake batter flavor! Thanks, Allison! Too much frosting is too sweet for me, but this shake has the perfect amount! So easy to make, too! Thanks, Karen! It's definitely an easier method to making the shake, rather than baking a whole cake. I hope you like this if you try it! I always get the same boring oreo blizzard every time I go to DQ. I really need to try something new. I love super sweet things so I would probably love their cake batter blizzard. And I'm sure would love this one too. Sprinkles are so much fun! Sounds like that cake batter blizzard would be right up your alley, Christin! And I'm sure you would love this milkshake, too. Creamy, sweet, and delicious! How disappointing that the DQ blizzard wasn't what you had hoped. But kinda awesome too, because then you created this goodness and shared it with us! :) Love this milkshake, especially with the extra sprinkles on top! It was a major disappointment because I usually love DQ blizzards! But you're right...it inspired me to create this cake batter shake, which was even better than DQ. Thanks, Jocelyn! Love the new photos! Definitely going to try it! Pinning! Great Job on the Photos! Birthday cake milkshake picture got me to click without hesitation!